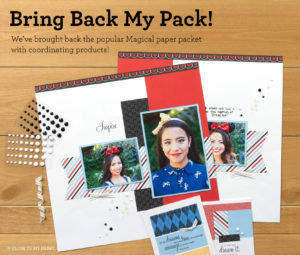 Close to My Heart is bringing back Magical, a much-loved paper packet, refreshed with new colors that will be coming out in Holiday Expressions. This updated Magical paper packet, coordinating cardstock, and the Dreams stamp set are sure to put you in a magical mood during AUGUST AND SEPTEMBER! They have created a special workshop kit featuring this paper packet and stamp set. The products in this workshop kit include the patterned paper, cardstock, embellishments, and stamp set needed to create four two-page layouts and eight cards, 4 each of 2 designs. You can view the Magical workshop kit at maryabrooks.ctmh.com. Grab a kit before it is gone!! ← Christmas in July Flash Sale!